Experience all of the benefits of a traditional movie theater without even leaving your house! A custom home theater installation New York brings you the freedom to select the movies you want to watch, whenever you want to watch them, and offers the more dynamic way to watch them then the traditional theater. A home theater system can be either easy or complex according to one’s personal desires and taste: from flat panel TV mount, LCD wall-mounted televisions with an advanced quality sound system, to an ultra high-end home theater rooms with fashionable reclining theater seats, a universal projector mount, a home theater projector, multi-room audio, a wall-sized screen, or a lighting control system with automated shades and curtains. Imagine your home theater delivering the equivalent of a commercial movie theater, and all that is left for you is to grab a friend, popcorn, soda, and enjoy the show! Home theater room design:Pravda Inc. considers all of the particular details, including: the specific room dimensions, different wall construction types, lighting system control, best quality types of video display, particular interior design, home theater sound control and acoustics, integrated free standing and concealed components, ceiling speakers, speaker mounts, etc. 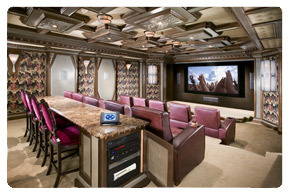 We offer custom home theater design to all of our clients with various budget sizes! Equipment selection:Pravda Inc. selects the tools necessary for home theater rooms installation and design that will insure the compatibility among all of the components that will optimize their performance! Oversight of the room installation:Pravda Inc. works with the best architects, builders, electricians, interior designers, and others to offer the best custom home theater room installation. We insure that the tools that we install, including the in-wall and in-ceiling cable runs maintain their signal strength without interfering with other lighting or electrical devices or sources. System design and engineeringPravda Inc. engineers will program the touch screen or handheld devices and controllers for a basic operation by anyone in the house. They will also explain and teach the household members on how to use those devices. System installationPravda Inc. brings together and assembles the tools necessary for completing the particular tasks even before delivering them to the job location. This insures the minimization of the time needed to complete a particular project saving energy, time, and money, for both parties!